I am excited to share this Giveaway with you. 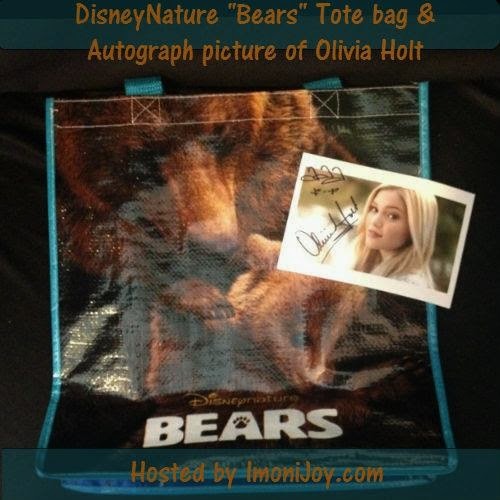 I've joined Kathy over at ImoniJoy.com to give our fans a chance to WIN a signed autographed picture of Olivia Holt. Olivia Holt, who is known for her role as Kim on the Disney XD series Kickin’ It and performs on the Disneynature's movie "Bears" sound track "Carry On". Also part of the prize pack is a DisneyNature "Bears" tote bag. She was blessed to have an opportunity to interview Olivia Holt and after the interview, Olivia was kinda enough to sign an autographed picture for her daughter and one Lucky FAN. Will Get MORE Chances to WIN! Disclaimer: Neither Imoni Joy nor any of the participating blogs are responsible for the prize. The sponsor is responsible for prize fulfillment. This giveaway is in no way connected to Facebook, Twitter or Pinterest.